The weekend before finals (last weekend) Lauren and I decided to go to Chamonix for the weekend, a tiny town known for its location to the mountains, especially Aiguille du Midi and Mont Blanc. It was very relaxing, a perfect weekend for a stress break (something I desperately needed!) 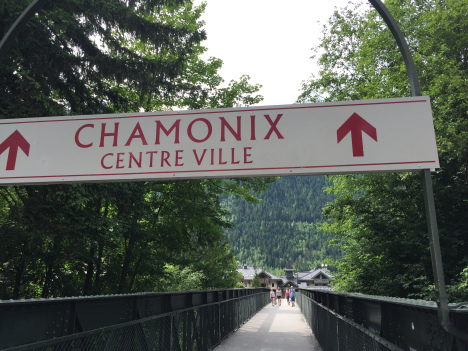 Chamonix was very different from the other trips I had been on, and while not my absolute favorite, it was definitely enjoyable. First things first, we needed to get there. We arrived early and were waiting at Part-Dieu’s train station in order to see what our part of the station our train was going to arrive at. The only issue was that we did not getting a number, we rather we got a little picture of a bus. We went up and asked someone for help in the best attempt at French as possible, and found out that we had accidentally purchased bus tickets, not train tickets. So fifteen minutes before our bus was about to leave, we were running around, trying to figure out not only which bus is ours, but where the buses even arrived! We thankfully had an older couple point us in the right direction, and our bus had a sign saying Chamonix on it, so we were able to get on in time, although it was too close of a call for my liking. The bus ride turned out to be extremely enjoyable however, as the views were amazing, and we stopped in extremely tiny towns to pick people up, so I was able to see the more rural side of France on our way. We arrived exactly on time, which was nice, and went to dinner right outside of the bus station because we were starving. When we left the restaurant however, we realized that we didn’t have data anymore (our plans had run out) so we couldn’t map out our path to our hotel. We asked for directions and went on our way, but after a bit realized it was too dark to chance not knowing exactly where we were going, so we stopped into a hotel that was not our own and were kindly given the wifi password so we could map out our destination. We ended up getting to our hotel in once piece, and thankfully too, as the hotel was absolutely perfect. L’Hotel Heliopic was potentially the most amazing hotel I have ever stayed in. 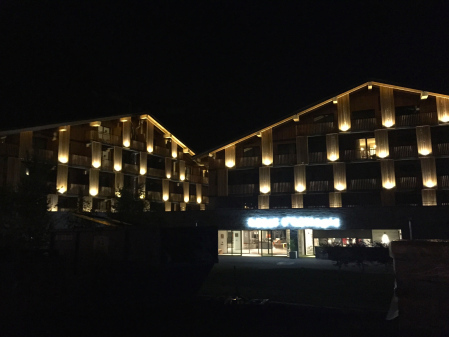 For starters, we got in and were upgraded to a room that was huge, as it had a bed for both Lauren and I, as well as a large bunk bed on the side in case we decided to adopt two children during our stay. The hotel also had the kindest staff, a free pool/spa where we ended up spending most of our Sunday, and had a lobby that was insanely awesome, there was a place for you to sit and listen to music, a lounge, a section for people working, even a children’s section with free food and drinks! The next morning we woke up early and went to see what everyone kept recommending, Aiguille du Midi, which happened to be right next to our hotel. Aiguille du Midi is a mountain, and there was a cable car that took us up 3842 meters (roughly 2.4 miles) to the top of the mountain. The cable car’s view was breathtaking, as we were able to see the town of Chamonix slowly get smaller and smaller, as well as the mountain’s side as we slowly ascended. There are two cable cars that take you up to the top, which I found very interesting as after the first one I was very impressed by how high we were, not realizing that we were going to go even higher. Once we got up there it was absolutely gorgeous. One of the people describing the mountain said that Mont Blanc (Aiguille du Midi is in the Mont Blanc massif) is the highest mountain in Europe at 4810 meters (about 3.0 miles high) and we at Aiguille du Midi were at the highest point someone could go in Europe without physically climbing up the mountain. I absolutely loved it, this was my favorite part of the trip, especially being able to play with some snow in the middle of summer. 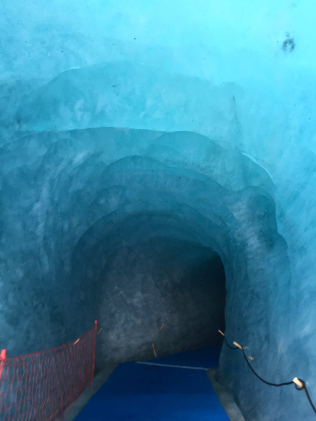 Because we had bought a ticket to Aiguille du Midi, we also had access to Mer de Glace, an ice cave. An ice cave sounded insanely cool, so we went right after lunch to the train at Train de Montenvers and hopped on to go to the cave. 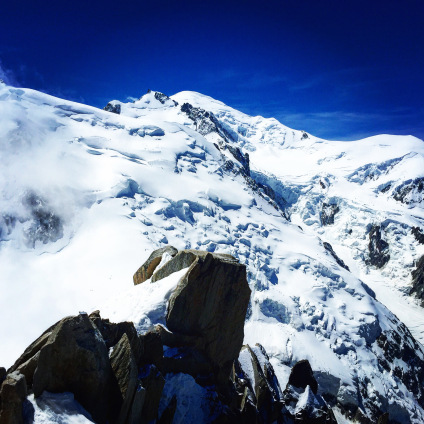 Surprisingly, the train ride was stunning and my favorite part of the ice cave adventure, as we were able to see Chamonix from up high, although in a completely different way from Aiguille du Midi. It was beautiful seeing the parts of Chamonix that are hiked most often, and riding through a beautiful forest. When we finally arrived to Mer de Glace we learned some interesting tidbits, such as the fact that it is France’s largest glacier, and that every year it moves. I can’t imagine what the walk to it must have been years ago, but I am jealous because walking down to the ice cave was rough. To get there we had to take another cable car, and then walk nearly 500 steps, passing plaques sharing its history, as well as signs that pointed out where the glacier was in a different year. The ice cave itself was interesting, and very beautiful thanks to all the lights glowing in the cave, but I must admit I was slightly disappointed. Maybe it was because it was smaller than I was imagining it was going to be, maybe it was because Lauren and I were in one of the last time slots so we had just run down 500 stairs, or maybe it was because I was blown away by Aiguille du Midi that morning, but it wasn’t as magnificent as I had hoped. Definitely interesting and worth seeing, but not as awe-inspiring as I was hoping. After the ice cave, the next 24 hours were the definition of a girl’s weekend. Lauren and I went out and had a nice dinner, then borrowed a romantic comedy from the hotel and watched that until we fell asleep. To top it off, the next day we spent at least five hours at the spa. I might be biased because I’ve never been to a spa before, but the hotel’s spa was absolutely magnificent. We got dressed in our bathing suits and fluffy bathrobes, and then went down and just relaxed. 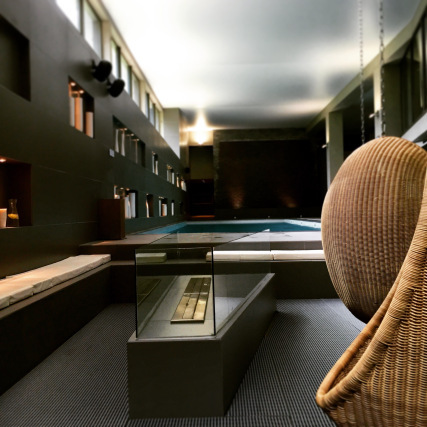 The hotel had not only a pool, but a jacuzzi, an ice room, an ice bath, a sauna, a steam room, a tepidarium, a bunch of other things I don’t even know the names for, and an area to sit in an egg-like chair and drink tea. It was lovely. Due to the fact we had a marketing final on Tuesday, we spent the majority of our time in the spa studying Quizlets, but even studying for five hours straight was relaxing in this little heaven. As relaxing as the entire weekend was, one thing that disrupted the ambience was the pain of getting home. 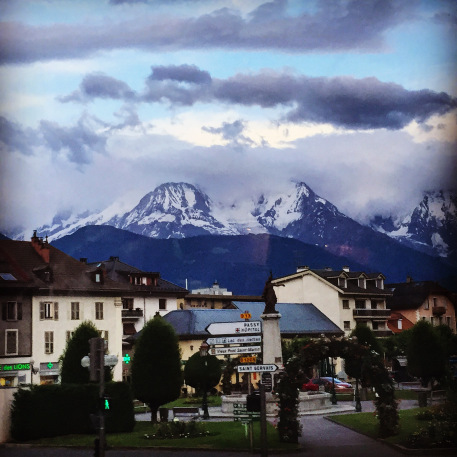 The way we booked our tickets home has us leaving Chamonix on a bus to Annecy, having a thirteen minute layover, and then taking a train back to Lyon. Already that’s a tad stressful, as it was raining in Chamonix, and if our bus was late we were done for. So Lauren and I were slightly worried, but I figured we just had to pray the bus was on time. What I apparently should have been worried about was whether or not the bus was even going to show up in Chamonix, because it didn’t. There was a glitch in the system, so the bus was not sent for. Which was not stressful at all, especially when I had school the next day. The people at the bus station were very understanding of our stress, and sent for a taxi that broke pretty much every speed law in France to get us to a train station the next town over in time to catch a train that was leaving for Annecy 25 minutes later. We managed to make the train to Annecy, but if the people at the bus station had not called ahead to warn them about a bus-sized amount of people were soon to be desperately running to the train it would have most definitely left, as after I got on and sat down, literally two seconds later the train pulled out of the station. We had no idea what time the train was going to get into Annecy either, so we had no idea how much time we were going to have to find our next train to Lyon. Thankfully it ended up being around 20 minutes, so we were finally able to take our time after having an exciting few hours of running for transportation. Chamonix was what I needed that weekend. I felt as though I was constantly on the go, from classes in Lyon to a weekend seeing everything there was to see in a new city, but Chamonix was a wonderful place to slow down and take a break. I probably wouldn’t go back to Chamonix because it overall wasn’t exactly for me, I much preferred Annecy and its lake to Chamonix and its mountains, but I liked being able to time out and appreciate the beauty of nature, while knowing that slowing down was a necessary part of appreciating the town. This entry was posted in Europe, Travel and tagged chamonix-aiguille-du-midi, chamonix-cable-car, chamonix-france, chamonix-mer-de-glace, chamonix-mont-blanc. Bookmark the permalink.